Heat oven to 350°F. Spray cookie sheet with cooking spray. In small bowl, mix cream cheese, beans and corn. In another small bowl, mix bread crumbs, Mexican cheese blend and melted butter. 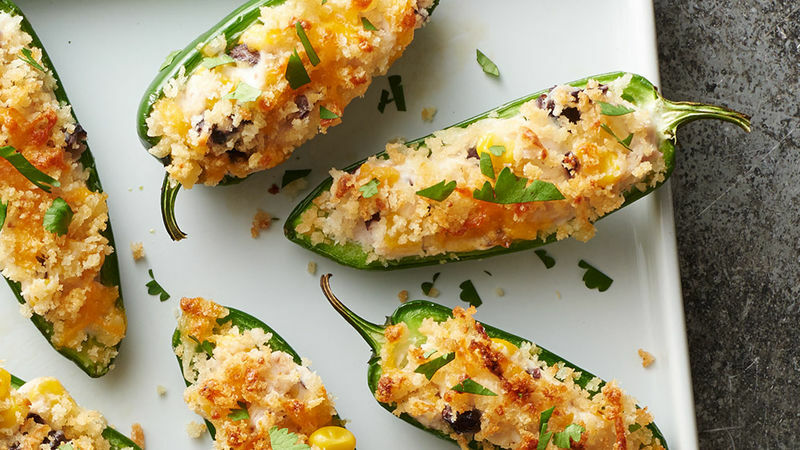 Divide cream cheese mixture evenly among jalapeño chile halves. Place on cookie sheet. Sprinkle chiles with bread crumb mixture; gently press into cream cheese mixture. Bake 28 to 32 minutes or until tops are light golden brown and chiles are tender. Sprinkle with cilantro. Serve warm. To prevent poppers from rolling while on the pan, slice a tiny (1/8-inch-thick) piece of skin from the bottom of each jalapeño half using a serrated knife. You can prepare the jalapeños and the cream cheese mixture and refrigerate separately, covered, up to a day ahead. Let cream cheese mixture soften at room temperature before filling peppers.